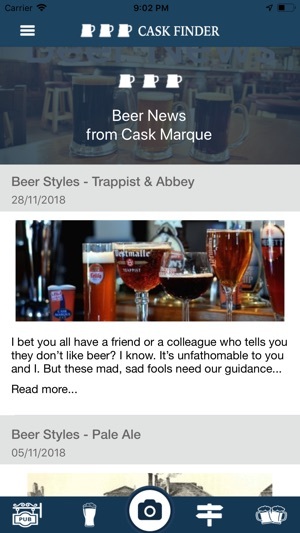 CaskFinder is the app from beer industry experts Cask Marque and is designed to help you find and enjoy cask ales all over the UK. Use the pub finder’s location finder to locate nearby pubs serving great quality cask ale. See what cask ales they had on sale when Cask Marque’s team of 50 professional beer inspectors last visited. If the licensee has access to our system they may also have listed what other beers they sell, including stout, craft beers and lager. New beers are constantly being added by brewers in both the UK and overseas. Choose from over 1300 brewers and see all their beers in one place. When you are in the pub, if you don’t recognise a beer then use our pump scanner to take a picture of the pump and within a few seconds receive back tasting notes telling you what to expect in terms of colour, smell, taste and more. 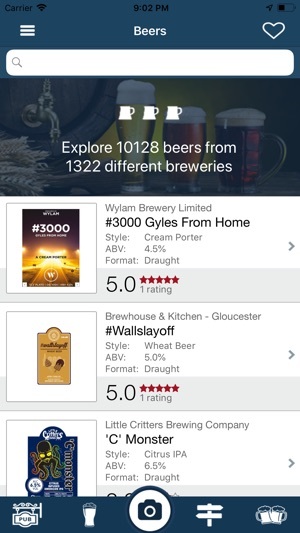 On the beers page you can see over 10,000 different beers with tasting notes stored on the Inapub database, which along with Cask Marque, powers the data behind the app. Click on the beers and find tasting notes from Cyclopsbeer.co.uk as well as lots more information including calories, beer & food match and interesting facts. If you haven’t already done so, join the World’s Biggest Ale Trail and discover new pubs all over the UK. 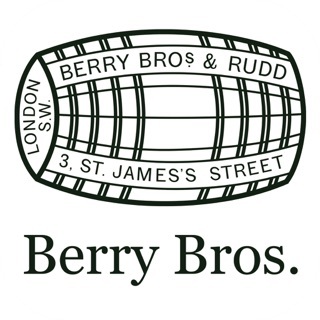 You have about 10,000 to choose from and they have all won the Cask Marque Award for the quality of their cask beer. Scan the QR code on the pub’s Cask Marque certificate and win prizes as you go. 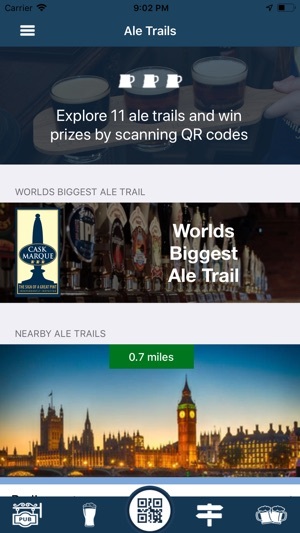 On top of this the app now offers ale trails from our corporate customers and Visit England. Complete smaller ale trails and win prizes from our partners, as well as see beautiful parts of the country. 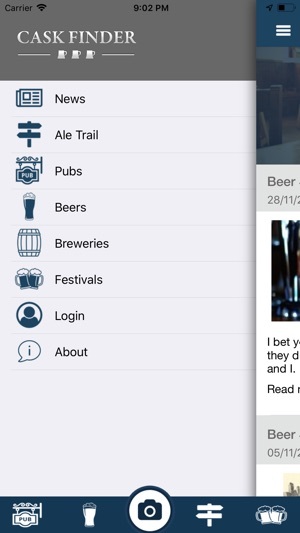 CaskFinder is not just another list of pubs – it is an indispensable tool for every beer lover! Please note that many pubs regularly rotate their beers and once they are sold out, change them for another. Cask Ale, by its nature does not have a long shelf life, and should be sold within 3 days of putting on sale. Accordingly, some pubs may not have the same beers in stock today than when they were last visited by a Cask Marque assessor, so if you are travelling a long way to sample a particular beer, phone ahead to check before you set out to avoid a wasted trip – you can access the pub’s phone number from CaskFinder automatically from the pub details page. Indispensable when visiting the U.K.
Used this app as my guide to pubs in the UK during my trip in March. 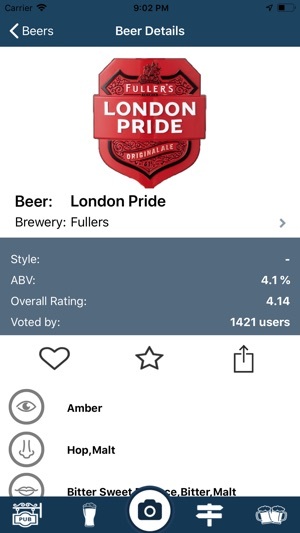 Extremely helpful for both locating local pubs and for educating visitors to the UK about UK breweries and their beers. Thanks for this great app! Will be using it even more during my next trip! In England from the Colonies and enjoying excellent beer as we travel. Helps find a pub with mapping especially when needing to use the facilities 😉. I am an American who is totally enamored with "Real Ale." This app gets me to an outstanding pint wherever I am in the UK!